A new travel company makes every attempt to stand out in its niche market from rival businesses. Its name should be unique, simple, catchy, and it conveys a brand message to the potential customers. But you should pick a name for your new company carefully. By naming your business appropriately, you let your customers know what your company makes or sells. It matters a lot especially for a new company that wishes to take its brand to people. If a name can tell a brand story, that is even better for the business. What is more, a well-thought-of name can also help in building a positive perception about the company. People can make an opinion about a business just on hearing its company name. Therefore, the name should sound good and unique to the people. However, you need to strict with some naming strategies, rather than just following your instinct. Naming a company randomly without any thought behind it can even prove to be costly as you may lose customers. If you are looking for some exciting name ideas for your travel company, we can help. Here is a key list of some unique business name ideas for a travel company. Modern travel business comprises of dozens of niches, and many more add to this list every year. These niches include adventure travel, cultural tourism, culinary tourism, nature & wildlife tourism, religious pilgrimages, and road tripping. So, which travel market niche your company follows? The name of your company should reflect the market you want to target. That is the way to ensure that people find out your business right away when they look for specific travel services you offer. Travel company logos also usually have company names, which is another reason to have an appropriate name. The logo and the name becomes a cost-effective means of promoting your new travel venture. Although your company is new, you must have given a thought about its brand personality. Do you want to protect your business as something robust or softer? How would you like your target customers to see your business? You should answer such questions precisely to find out about the personality of your company. Now that you know it, it is the time to represent it in your company name. Your tour and travel logo will also reflect the brand you showcase in your market. So, a logo that has a perfect company name will ensure that people can find out not only what your services are but also the values you follow. Most businesses want to stand out from their competitors. In their zeal, many such new companies pick a name that seems somewhat mysterious to people. They adopt such names hoping that people will take quick notice of their business. But that is a big mistake as people do not like the names that fail to convey a meaning straightforwardly. So, avoid having a name that comes from an alien culture, language, and looks strange in your travel niche. Moreover, your hotel logo design or a logo from any other niche might give a wrong impression of your business. While your travel company aims to be in a particular niche market, it will be growing in the future. You will reach out to a different set of customers and new markets. You may also deliver new useful services to customers. There is no end to the future expansion of your current small company. If you pick a name that speaks only about a specific market, geographic location, and a set of customers, it will fail to reflect the expansion. Therefore, make sure that the words used in the name are flexible meaning to cover future growth of your business. Know also that travel logos also need to be redesigned in case there is a change in the company name. Start a brainstorming session with your friends, members of your company, and others. Give them some guidelines on which they will be thinking about the potential name ideas. You will need more sessions to get a shortlist of the name ideas. During the meetings, discuss the pros and cons of the names. Remember that your logo designer will get the design ideas based on your travel company name. So, pick a name that looks great on your logo, which is the face of your new business. A simple name can quickly convey your message of business to the potential customers. It also communicates with the audience due to easy words and sounds. A simple name is the one that people can understand, pronounce, and write effortlessly. Do not forget that in this digital age, your customers need to remember the name to type it on the search browsers. Also, your professional graphic designer will love to have a clean and simple name. Such names help generate creative design ideas. Another thing to consider is regarding your business rivals. To carve out a distinctive place for your company in your niche market, you have to stand out in many ways. So, your travel company name also should be different from your competitors’ company names. You need to make a list of their business names to make sure that you do not pick a similar name. Note down the features of their names so that you can know how to create a unique name that stands out. Also, you must note that a name entirely different from your competitors also helps in getting new graphic design ideas. This is because company names inspire most ideas. 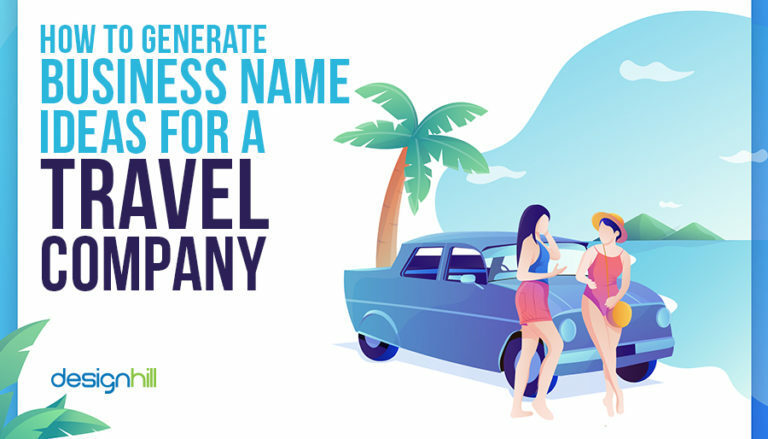 Fortunately, several name generator websites can also help you get new naming ideas for your travel company. As you type some keywords related to your niches, these sites quickly come out with a long list of potential business ideas. So, you have access to dozens of names. However, not all the names are suitable as you get them using the software. Many such names are not appropriate. Therefore, you should be careful in using such names. But make sure that the name you get from the software is unique. When you hire graphic design services, such a name will help generate design ideas that stand out. Now that you have prepared a short list of names for your travel company, you should ensure its availability as your trademark. Hundreds of travel businesses register their names as their trademark to protect their right over the name. Remember that your company name is also your brand identity which you should legally protect to secure your business interests. A domain name is the first requirement if you plan to launch your travel company online. The domain or URL is the web address of your company on the web. Your potential customers will look for your business using your domain address. So, before creating your web page design, make sure that your company name is available to you as your domain. Your travel business will also use several social media channels to promote your niche services. Social channels are essential to drive customers as most people, and potential customers use the media to research information and buy services or products. However, before creating your social media page design for your travel business, make sure that your company name is also available as your social handle. If someone has already registered the name you want, you can tweak it a little to get it as your username for social media. So, keep these basics but vital points in mind when making a shortlist of potential names for your travel company. The naming process may take some more days than expected as you go through several brainstorming sessions. But do not settle for a casual name that leaves a wrong impression about your business. Once you have finally picked a perfect business name for your upcoming travel venture, it is now time to take it to the potential customers who matter. You need to make a lasting impression on them by using some visuals such as your logo, business cards, websites, brochures, and even a mobile app. To create these visual identities of your business at an affordable price, you can rely on Designhill, a leading marketplace. You get dozens of unique design ideas in response to your design contest at this site. The name of your travel business is the identity of business in the niche market. Choose a simple and unique name that is good enough to send the right signals to your audience. Pick a name that reflects your niche and brand personality. But such a name must also be legally available as your trademark, domain, and social handle.